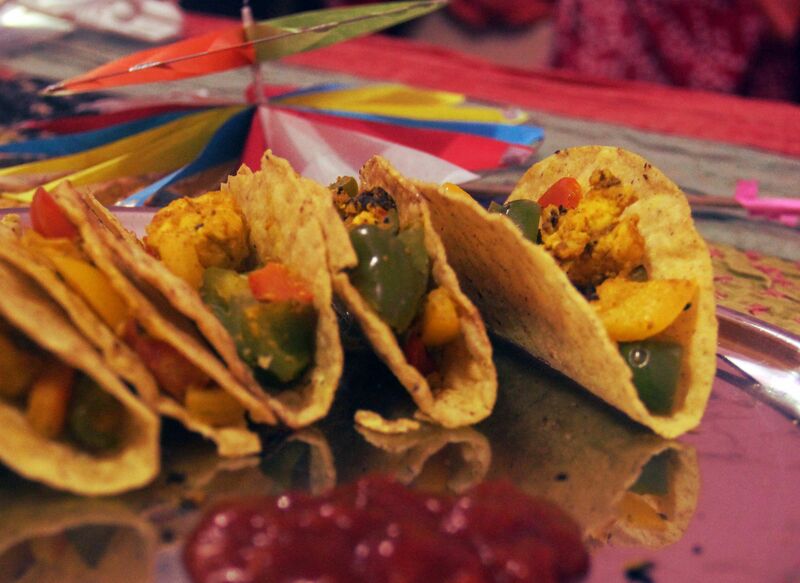 My Recipe #8 of 30 recipe challenge is Paneer Tikka Tacos. This is a fusion of Mexican and Indian cuisines, and tasted awesome. Taking inspiration from here, I tweaked the recipe a bit according to my taste. 1. If using frozen paneer, soak in water for some time to make it softer. 2. Mix all the spice powders, salt, lime juice, and yogurt until homogeneous. 3. Add the paneer, bell pepper, and tomato to the bowl and mix thoroughly until all the veggies and paneer are fully covered in the spicy yogurt marinade. 4. Marinade in the fridge for at least 2 hours. 5. Pre-heat a large pan to medium high heat. Add Olive oil to the pan. Add panner/veggie mixture. 6. Grill for 7-10 minutes, then mix. Grill for another 7-10 minutes or until paneer starts turning light brown. 7. Pre-heat a small griddle or non-stick pan to medium heat. Heat tortillas until warm and soft. 8. Fill the tortillas with the paneer tikka, garnish with chopped cilantro and sprinkle with lime juice. 9. Serve with Salsa, and enjoy the feast! This entry was posted in The Kitchen and tagged vegetarian recipes. Bookmark the permalink.